I've long been obsessed with moisturizers. But recently, the obsession has narrowed a bit, focusing mainly on moisturizers of the gel cream variety. I find that regular moisturizers are a bit too heavy for my sensitive skin, especially in the warm summer months -- not to mention gel creams are cooling and delightful when it's sticky and humid. 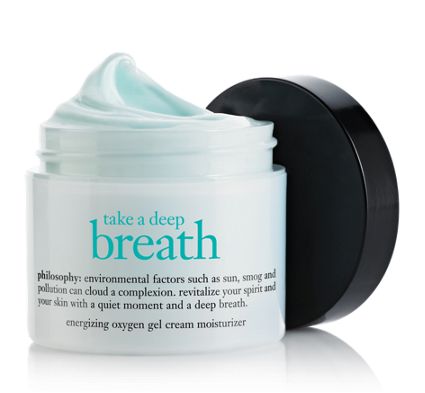 Enter Philosophy Take A Deep Breath Energizing Oxygen Gel Cream Moisturizer. As is normally the case for me, Philosophy delivers. This moisturizer works to bring oxygen to the skin, creating a healthy glow and working against environmental and lifestyle factors (like the smog and recycled air my skin is subject to so often as an NYC resident and frequent traveler). What does this mean? Skin is clear, radiant and fresh -- all thanks to this lightweight, cool, hydrating moisturizer! And here's the best part. One lucky winner has the chance to receive a tub of Philosophy Take A Deep Breath today! This giveaway has a retail value of $34. Here's how to enter. 2) Get an extra entry for liking The Beauty of Life on Facebook and leaving a comment on the Facebook post about this giveaway telling me why you want to win this moisturizer. If you're already a Facebook fan, be sure to leave this comment on the Facebook post for your extra entry! This giveaway ends on Monday, August 13 at midnight. One winner will be chosen AT RANDOM on Tuesday, August 14. Maximum of THREE ENTRIES (one for each way listed above). Multiple entries will be disqualified. Giveaway is open to US residents only. What a great Philosophy product for your giveaway! Please enter my giveaway as well! Phillosophy product are the best! HUGE Pholosophy fan! I use the Purity daily, and it has made such a difference. I need to take a deep breath! I love philosophy products! Thanks for the giveaway! This product sounds different. I really want to try it. The oxygen sounds effective. Would love to try this. Thank you for the chance! Never tried any Philosphy products. My poor face needs it! I love Philosphy products and have been dying to try this one! I would love to win this! I love Philosophy and their products. Being unemployed has lead me to use drugstore brands and they're just not as top notch as Philosophy! I would love to try this new product, as I do already love Hope in a Jar. My skin needs to take a deep breath! This would be perfect for the hot, sticky summer! I love Philosophy products but I had not seen this one yet. I'd be happy to try it out! This sounds *perfect* for my dry skin-- my usual moisturizer is just a bit too heavy, leaving my skin feeling quite sticky. Thank you for this amazing giveaway! Sounds like just what my dry skin needs. Thanks for the chance. Ohhh I really really want to try this!!! Thanks for offering this, what a great opportunity to try a new product. Thank you for the great giveaway!! I LOVE Philosophy! OH!!! I love this moisturizer! I only have one philosophy product and I love it. I would love to get a chance to try this one too! I'm a huge fan of Philosophy's Hope in a Jar, and I have to say with this it sounds like Philosophy has done it again! Philosophy is such a great brand, with amazing products. This is new to me and would love to try this Philosophy product to help my face feel fresh and with natural glow. I tried a sample of this and loved it! I'd love to win this product. This looks great. I've been searching for a new moisturizer, and I might have to give this one a try. I know Sephora carries Philosophy products, so I'll definitely be dropping in later! I've always wanted to try Philosophy's products! I follow you on Facebook and Twitter, follow Philosophy on Twitter and I tweeted about the giveaway. I've been obsessed with gel creams lately - this would be a new discovery and a good, possibly more moisturizing, alt to my Garnier! I've been dying to try this. I use all Philosophy skin care products. This looks like a great moisturizer! I <3 philosophy! What a great giveaway! Thank you! I would love to try this, thank you so much! Another fabulous beauty giveaway. I love philosophy products and could really use this product because my skin has gotten incredibly dry, which ages me. Philosophy has terrific products for the skin and I'm sure this one is no different. Good luck to everyone. My email address is kleimanlaw at aol dot com. I also completed all the requirements for this contest including tweeting this contest on my twitter page, @DianeLori. Love to win hydrating moisturizer as Philosophy product are the best. Thanks for a great giveaway and to Diane Lori for sharing the page with me on Facebook. I am tweeting too @Dutchbrosluv and following. Yes please I love Philosophy! It looks good enough to dive in to. Thanks for chance to win. I love Philosophy products and this looks like a perfect moisturizer. I'm a big fan of Philosophy and would love to win this moisturizer! Thanks! I have never tried a gel moisturizer, but if it is Philosphy it must be good. Philosophy products are always top quality.